Did you know that small businesses have $825 billion in unpaid invoices?¹ Fortunately, invoice factoring can help you obtain fast access to capital by leveraging unpaid invoices. Unpaid invoices are an unfortunate reality for small businesses across the nation. And as a business owner, there’s nothing more frustrating than not getting paid for your goods or services. These cash flow gaps can make it hard to manage expenses. Fortunately, invoice factoring solutions, commonly referred to as accounts receivable financing, make it easier to pay your bills on time, allowing you to focus on the other tasks you need to get done. We understand that choosing an invoice factoring company can be a complicated process. To help you cut through the noise, we’re exploring our favorite invoice factoring companies for small businesses. Lendio is one of the most recognizable small business loan marketplaces. Rather than originating loans on its own, Lendio acts as a “matchmaker” by connecting borrowers with a network of 75+ lenders—some of which are included on this list. Essentially, they’re the Amazon of small business loans. If your company meets these eligibility requirements, Lendio should be your go-to lending option. Its fast, easy, and comprehensive platform has helped over 33,000 small-business owners secure more than $650 million in loans since 2011. Lendio’s fast, easy, and comprehensive platform has helped over 33,000 small-business owners secure more than $650 million in loans since 2011. You require quick approval and fast funding. You want to weigh your loan options. You’re comfortable with rate uncertainty. You’ve been in business fewer than six months. Your credit score is under 550. Your monthly income is less than $10,000. Like Lendio, Nav is not a lender. Its lender marketplace helps business owners find the best financing option based on their credit scores and business profiles. Even better, Nav’s marketplace is lender neutral, meaning that their lender recommendations aren’t swayed by pressure (or payment) from the lenders themselves. If you need more in-depth features, opt for their premium plan at $24.99 per month. Enjoy all the benefits of the free plan, plus two personal credit scores, two business credit scores, full credit reports, and $1 personal identity theft insurance protection. Levi King, who co-founded Lendio, founded Nav to help business owners become better-qualified applicants. You want a variety of loan options. You value fast approval and minimal paperwork. You can’t afford the relatively high rates. While Fundbox doesn’t offer invoice factoring, they caught our eye thanks to their fast short-term invoice financing. With Fundbox’s invoice financing, also called “Fundbox Credit,” business owners can borrow up to $100,000 and get 100% of the value of invoices that they’re waiting for customers to pay. Unlike invoice factoring, the loan must be repaid in 12 or 24 weekly installments. Depending on your repayment schedule and fee amount, your APR can range from 10.1% to 78.6%. We’re not going to lie to you—Fundbox’s invoice financing rates are higher than traditional banks and some other online lenders. However, there is a silver lining. They allow you to repay the invoice financing early to save on fees, which significantly lowers your APR. Plus, Fundbox works directly with you rather than with your clients. Once unpaid invoices have been redeemed, the funds are deposited into your bank account. You have an extremely low credit score. You need more than $100,000 in funding. You don’t use a compatible accounting software, such as FreshBooks or QuickBooks. While BlueVine’s qualification requirements are quite lenient, keep in mind that it’s not the cheapest invoice factoring available. With annual percentage rates of up to 68%, you should use its invoice factoring as a short-term solution. After you get approved, their system allows you to automatically sync invoices from their accounting software. You meet their minimum qualifications. You can’t afford its pricey plans. As a publicly traded bank, Triumph Business Capital offers a variety of products, such as equipment financing, asset-based lending, and traditional term loans. Triumph works with both small businesses and mid-sized businesses. As for their invoice factoring services, they specialize in helping different industries, including oil and gas, government contractors, trucking, freight brokers, and staffing. In fact, they have dedicated teams for each industry, so rest assured, you won’t be just a number in their system. Now for the downsides: Triumph Business Capital will make a hard credit pull on your personal credit score when you apply. Not to mention, you’ll be charged a $300 origination fee. If you don’t get approved, all of this will be for nothing. So make sure you meet their eligibility requirements before considering this invoice factoring option. As for Triumph Business Capital’s invoice factoring rates, it’s difficult to give you a precise price due to the lack of information on its website. However, we did find an invoice financing calculator that allows you to determine your rates, fees, and APR. Before applying, consider speaking with a representative to learn more about their policies, factoring fees, and rates. You need more specialized loans. You value personal relationships with your lender. You don’t want a hard credit check. You can’t afford their fees. Invoice financing allows you to borrow money against unpaid invoices. Once you collect your money from your client, you must pay the lender back the amount loaned along with fees. Invoice factoring involves selling the invoice to the lender for a percentage of the total. The lender will then deal with the client to collect the full amount. While both invoice factoring and invoice financing can cover cash flow gaps, it’s important to understand the difference between the two before you decide which one will work for your business. What are the pros and cons of invoice factoring? Just like any other business loan, invoice factoring offers both pros and cons. Pros include immediate and ongoing cash flow, better approval chances, and healthier customer relationships. Cons include high factoring fees, lack of control of invoices, and reliance on customers. Oh, and perhaps the most beneficial aspect of invoice factoring is the fact that you won’t have to pledge physical collateral to secure payment. So you’ll get to keep your beloved family boat. If you have non-recourse invoice factoring, you’re in luck. In this scenario, the lender will assume the risk of non-payment. With recourse invoice factoring, by contrast, you (the business owner) agree to absorb most of the risk—which is typically a more affordable option. Does invoice factoring require a credit check? Another cool fact about invoice factoring is that your credit score won’t be a major deciding factor during the approval process. Instead, the factoring company conducts credit checks on your customers to ensure that they’ll pay in a timely manner. Imagine not having to worry about tracking down your customers and asking them to pay up. If it seems like waiting to get paid is what you end up doing most, it may be time to consider invoice factoring services. Overall, we think Lendio is the best choice for most businesses that require invoice factoring. 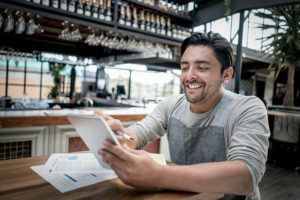 However, your own unique business needs and preferences as a small business owner will influence which invoice factoring company will work for you. If you prefer a different online loan company that we didn’t include above, let us know! Comment below to help us improve our recommendations.